I’ve never reviewed a cookbook on this blog and honestly I’m not sure why. I love cookbooks. I can spend many calming hours reading them, and even more countless hours using them to cook for myself, my friends, and my family. I first fell in love with cooking in high school when my mum brought River Cottage Veg Everyday on a whim, the photos were vibrant, the recipes easy to follow, and the tasty end results made trying new recipes addictive. When asked what the last book I read was I would never say Simply Nigella, Madhur Jaffrey’s World Vegetarian or Plenty More; I would more likely end up talking about one of the books I powered through for my English Literature course, when in reality I enjoyed perusing the pages of, say, The Clandestine Cake Club Cookbook for an hour or so much more. Before I started University I created a cookbook of my own, where I wrote out all my favourite recipes that I found from various places, tweaking them as I transcribed them to suit my tastes. My cookbook is therefore constantly evolving as I discover new food writers and new flavours – and I’m sure many recipes from Flavour are going to make in into my food stained, hand penned pages. 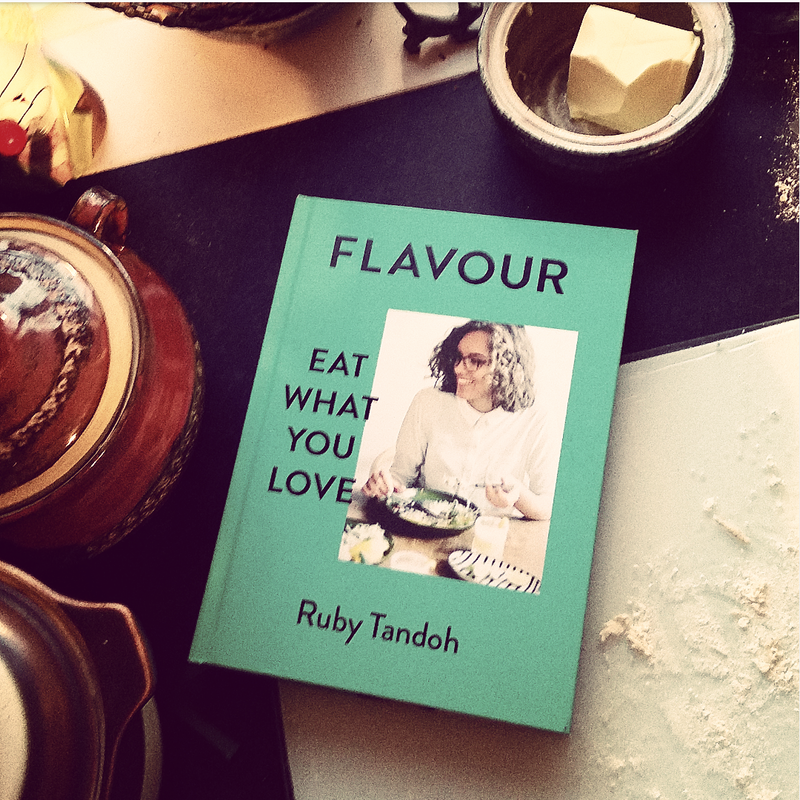 So now on to the main section of this post, the book that has inspired me to write in this way about my love affair with cookbooks – Ruby Tandoh’s Flavour. Ruby appeared on the 4th season of The Great British Bake Off which was first broadcast in 2013, admittedly I didn’t pay that much attention to her back then when I first watched the series. Dare I say it I remember that I found her self-deprecating attitude a tad annoying. Since then I have read her food columns in the Guardian but never really connected to her as a person, but last week the entirety of season 4 was broadcast as a marathon on some free view channel. I dipped in and out of watching it throughout the day as I did my knitting and baking. Although I already knew the result, I found that I was routing for Ruby throughout the day. I see a lot of myself in the 20 year old student she was when she appeared on the show, her lack of confidence in her bakes I see in my own lack of confidence in work I produce. I am a 19 year old student who suffers from anxiety so in the space of an afternoon I absolutely fell in love with the anxious, unsure, young woman I saw on the screen. So I was straight onto her Instagram page and upon finding out she had a new book out – I had to have it! Flavour is split into chapters by ingredient rather than the occasion the dishes best suit, as many cookbooks are; as a pescatarian I found that the book isn’t overloaded with meat dishes (nor is it overloaded with fishes dishes, it would still be worth the money if you wanted to use only the veggie recipes). The introduction calling for the ‘best-quality meat you can afford’ and table salt ‘because this is what most people have to hand’ sets the tone for the book, none of the recipes require overly-expensive or inaccessible ingredients. I think Ruby is remembering the student she was on GBBO who had to rehearse bakes on the floor, if she had the resources to rehearse them at all that was. The photos in the book are vibrant and not overly staged – the food looks real and highly appealing and each recipe is accompanied by a few sentences about the recipe which show off Ruby’s love and understanding of flavours as well as her wit. The recipes are easy to follow and tweak, and each one I’ve tried so far has been absolutely delicious! The full title Flavour: Eat What You Love summarises the focus of the book – satisfying and vibrant food, often full of vegetables and pulses, not because of half-baked health claims, but because they taste good and they make you feel good. I am going to end this post, which has turned out to be a lot longer than expected, with a short extract from Ruby’s book. This is from the introduction to the ‘Lentils and Pulses’ chapter, and I completely relate to the need for recipes that not only help with, but also work with, anxiety. “I have a survival kit. […] When anxiety flares up, there are the things that don’t just keep me afloat, but raise me higher: a pot of glitter nail varnish, thick with sparkle flecks; Bridget Jones’s Diary on a scuffed DVD; a stack of Nigel Slater books, so gleeful in their food-positivity that they can rouse my appetite even when I’m sick with tiredness; a framed photo of Laverne Cox, radiant with a milkshake; a small archive of Harry Styles hairstyle pictures.